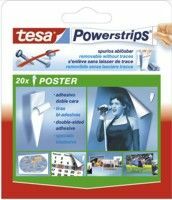 Optional Accessories for Posters including velcro, powerstrips etc. A very easy to use snap-action aluminium rail, designed to support a range of printable media including paper, card, PVC and fabric. 25mm x 13mm profile. Card A4 packaging box Ideal for your A0 Fabric posters. Slim boxes are perfect for presenting your print media in a smart and professional way. Fully recyclable, these boxes are manufactured in white card which is very sturdy and will protect your fabric. The Fabric posters are further protected by being enclosed in Grip Seal Bags, Clear Plain Self Sealable Poly Plastic bags. These are already supplied with your order and included in the cost of one Premium Fabric poster. 1 pack consisting of 6 Self Adheisive 22mm Velcro dots (Hook) and 6 self adheisive 22mm (loop) with 6 White Drawing pins. These are already supplied and included in the cost of a Silk Fabric poster (1 pack per poster). Removable double sided strips for light or fragile objects such as posters, memos, charts or drawings. Removable at any time without trace. Also usable on sensitive surfaces like wallpaper or gloss surfaces. Also available, Velcro Hook & Loop and self adheisive hanging tabs. A small selection of popular materials to mount your poster onto. If you require lamination on your posters please select it when ordering your prints using the poster price calculator on the poster page. We will supply your print mounted onto any of the mount boards ordered here. The maximum size mounted poster we can ship by post is A2. Larger sizes must go via Overnight courier.